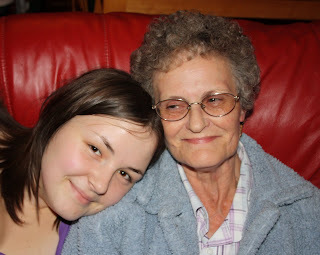 Last week my Nan was diagnosed with cancer (of the womb). We knew that it was a possibility, but I was quite shocked when it was definite and I still don't think it's really sunk in! She has to have an MRI scan on Sunday and a hysterectomy sometime within the next couple of weeks. Hopefully, that's all the treatment that will be required - they wont know the staging/grading until her scan and op, but they think they may have caught it early and I really hope that that's the case. It's all a bit weird, when my Nan had an operation a couple of weeks ago - it was in the same Hospital, same ward...and same bed. Maybe that bed is jinxed? Maybe it's a good job that Hospital is being knocked down soon!! Also, I was reading through my Nan's information the other day, turned the page and it said 'Oncologist: Dr Tahir'. Now we have the same oncologist! I am sure you all know how much I love him, so I am glad that he'll be taking care of my Nan. She has met him before (when I was having treatment) and she thought he was nice so I hope that makes her feel a bit better. My Nan is amazing, she's like my friend as well as the worlds best Grandmother. She is a very strong person and I do believe that she can get through this. I am sure she would really appreciate everyone's thoughts and prayers. * Me and my Nan. 12th October 2009. It's almost 2 years since I had the operation to remove the polyp from my vocal chord. 2 years!! That's crazy. That means that cancer has been in my life for 2 years now, I was finally starting to not think about it every day and now my Nan has it which is crap...but c'est la vie! Just another bump in the road and hopefully once my Nan beats this, cancer will get the picture and stay away!!!!!! lol. Things on my part are good, voice is good(ish), checks ups are good, hair is good...it's all good lol. Much love and many good vibes to your Nan. Hayley, sending your nan and all your family lots of love and hugs. Dr Tahir will give her the same amazing care that you received, I'm sure. Men who are experiencing symptoms should visit their doctor as soon as possible, since symptoms are usually indicative of more advanced stages of prostate cancer.